Increased international pressure seems to be forcing the Pakistani authorities into taking action against piracy and copyright violations. In a surprise raid in Karachi last week, Pakistan's Federal Investigation Agency (FIA) recovered over 100,000 DVD copies of Indian movies and twice as many blank CDs from an illegal replication plant. The facility was sealed and the owner and manager of the plant taken into custody. But industry insiders remain deeply cynical regarding the prospects of such action becoming more common place or effective in the foreseeable future. At best, they say, pirated English movies may start drying up over a period of time but there is no chance of a similar fate being in store for Indian movies. 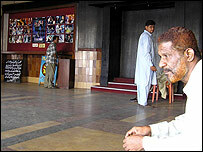 It is easy to understand why if you look at the extent to which Indian cinema has permeated life in Pakistan. "It all started with the arrival of the VCR in Pakistan somewhere in the mid-1970s," explains Khalid Jan Mohammed, a leading player in the DVD business. "At that time, no one had even heard of copyright." It was also the time when Pakistani expat workers in the Gulf states were sending back VCRs by the thousands. Within a few years, VCRs had made their way into every imaginable place - homes, eateries and even intra-city buses. For years Pakistanis had not been able to see Indian movies at the cinema because of the hostile relations between the two countries in the aftermath of their 1965 war. Now they suddenly found the latest Indian stuff available at corner shops for overnight rentals that rarely exceeded half a dollar. So why didn't the authorities clamp down on the pirated Indian video tapes? Nighat Said Khan, a left wing women's activist and social worker, points to an interesting reason why the government looked away as Indian movies started taking root with the Pakistani audience. "General Ziaul Haq's regime was an extremely oppressive one - a cultural nightmare," she says. "One of its key policy objectives was to keep people indoors. "In Gen Zia's orthodox outlook, any form of entertainment in a public place - especially where genders could mix - was against Islam." Ms Khan argues that the VCR came as an ideal magnet that would hold people at home in the evenings. The cultural policy that allowed pirated Indian movies to proliferate also had political connotations. "I am sure that at some level, allowing piracy of Indian films was considered a smart act of industrial sabotage by the Pakistani policy makers," says Ameed Riaz, the head of EMI Pakistan. "Basically, anything that hurt India was considered kosher." It is no coincidence that the first - little noticed - copyright law adopted in Pakistan in 1962 expressly stated that it did not cover Indian intellectual property. 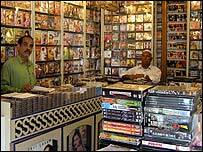 To crack down on pirated Indian DVDs now would be a massive undertaking. The decade of the 1980s saw the video rental business mushroom into one of the largest retail businesses in the country, employing an estimated half-a-million people. Not just that: Pakistan's fashion and modelling industry has come to be deeply dependent on the Indian film culture. Event management companies in Karachi that organise weddings for the affluent say that many brides want the wedding stage to resemble a set from a particular movie. The wedding set from Indian diva Aishwarya Rai's film, Hum Dil De Chuke Sanam, was replicated at so many weddings in Karachi that it became a joke. Street jargon employed by Bollywood crime characters has become every Pakistani parent's nightmare. Even the mullah in the mosque - if he wants to be popular with his audience - will base his religious anthems on popular Indian film music tunes. It is this historical evolution that copyright enforcers will have to fight if they want to stop Pakistan in its steady climb up the world's piracy charts. Government officials readily admit that checking piracy by raiding DVD rental shops would "take the battle to every nook and cranny of the country". No government can be expected to provide the resources or have the will for such a crackdown. What is more manageable is to stop the menace at the source. April's raid on one of the 10 known replication plants in Karachi may just be a step in that direction. But industry insiders say that such a crackdown is quite likely to focus on western English language movies for quite some time before it turns to Indian films.